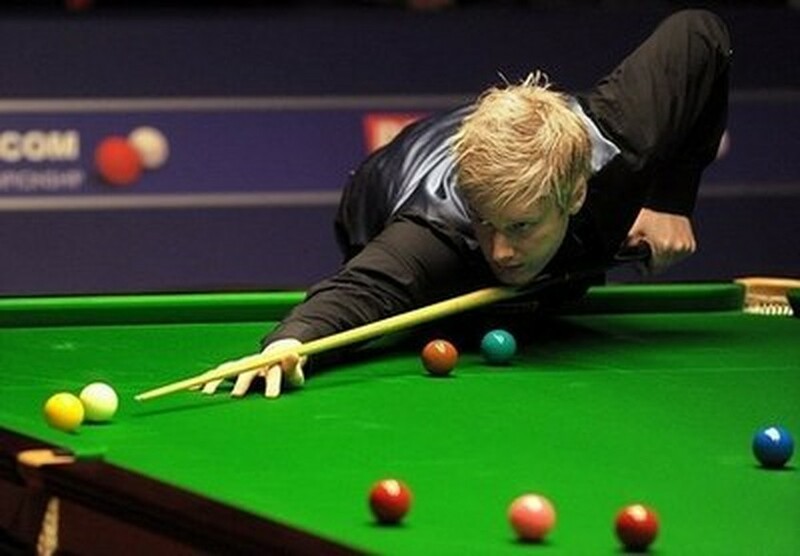 SHEFFIELD, England (AFP) – Australia's Neil Robertson won the snooker world championship at The Crucible on Tuesday, beating Scotland's Graeme Dott 18-13 in the final. The 28-year-old from Victoria became the first man from outside Britain and Ireland to win the title since Canadian Cliff Thorburn triumphed 1980. The Melbourne left-hander, dubbed the Thunder from Down Under, is the first Australian to win the title in the modern knockout era. The final was played out against the backdrop of the the bribe allegations surrounding world number one John Higgins. World snooker supremo Barry Hearn vowed on Monday that anyone found guilty of match-fixing would be dealt with severely and swiftly, after Higgins was suspended. Robertson took a 12-10 lead over 2006 champion Dott into the final session Monday, which rolled on past midnight. For the first time, the match was being shown live on Australian television. At 14-12 ahead with the reds cleared, Robertson missed a crucial brown to the left middle pocket at 57-40 up. But he went on to sink the pink and take the 45-minute frame for a three-frame lead, storming off with a trademark fist pump. Next frame Dott took four attempts to hit a red from a snooker and Robertson was on course to clean up but missed a black at 53-42 ahead. Clearing the colours, Dott left the pink over the pocket but Robertson rattled it in the jaws. Dott did not miss it at the second attempt and clawed back into the match at 15-13. In the 29th frame, both players missed a string of reds with Robertson 40-9 ahead as tiredness took its toll. The frustration showed as Dott pretended to slay Robertson with his cue. The right-hander left a red over the pocket at 53-23 and Robertson took the longest frame of the match, approaching 50 minutes. Next frame, Dott almost fluked three reds with a hit-and-hope effort at 37-0 down, and the Scot danced about the top end of the table watching the balls bounce around the jaws. Robertson put the white down but Dott missed his subsequent shot and the Australian went on to take the frame 58-10 for a 17-13 lead. Robertson broke off in the final frame, in which both players showed their fatigue. Dott missed a red and an unlucky double kiss left one over the bottom left pocket. Robertson played a plant for a 42-1 lead and the match time rolled past 12 hours. He sank a pink to leave Dott needing snookers, then blew a kiss to his mother, clutching the Australian flag, who had flown in in time to see her son win the title. The match won, Robertson completed a break of 53 to take the final frame 94-1. Robertson is the first man from outside Britain and Ireland to reach the final since 1983, when Thorburn lost to England's Steve Davis. He is the first Australian to reach the final since 1975 when Eddie Charlton lost 31-30 to Ray Reardon in a tournament staged at Charlton's club in Melbourne. Horace Lindrum, who triumphed 94-49 in 1952, is the only Australian to have won a world title, but that was the year when the sport's leading players staged a boycott and the two-player tournament is often disregarded. Robertson is the most successful player from outside the British Isles in ranking tournaments, having played in five finals and won them all. His previous best World Championship performance was reaching the semi-finals last year. Cricket umpire Dickie Bird, from the local south Yorkshire area, was among those in The Crucible watching the action.